New Haven, Mo. - Organizers have been preparing all day for tomorrow’s 6th Annual Fire Fest in Historic Downtown New Haven, Mo. with nice weather forecasted officials are expecting large crowds. Pictured above is candy purchased by the New Haven Police Department thanks to donations received from individuals and local area businesses. New Havne, Mo. - Every year the New Haven Police Department have made efforts so Trick r’ Treaters can enjoy a safe and fun Halloween. Below is a "Quick" Trick r' Treat plan of attack. Over 15 individuals and local area businesses, who have asked to remain anonymous, made donations towards purchasing all the candy (seen above) that will be handed out at the New Haven Ambulance building tonight. 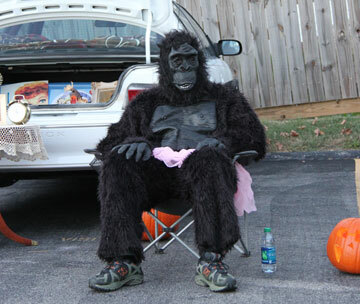 By Pastor David Poe who is pictured in the Gorilla costume from last year's "Trunk or Treat". New Haven, Mo. - “Trunk or Treat” will be held this Halloween, Oct. 31 beginning at 5:30 p.m. This year’s event will have a bounce house, barrel rides, games, popcorn stand, and hot dog stand. You can also sign-up to win a special Christian prize basket full of age appropriate goodies. Our members will be distributing candy from their decorated vehicles rain or shine, so make St. Peter’s United Church of Christ your first stop. Pictured is the Burning House of Fire and Ice. New Haven, Mo. - The sixth annual New Haven Fire Fest will be held this Saturday, November 2 in downtown New Haven. 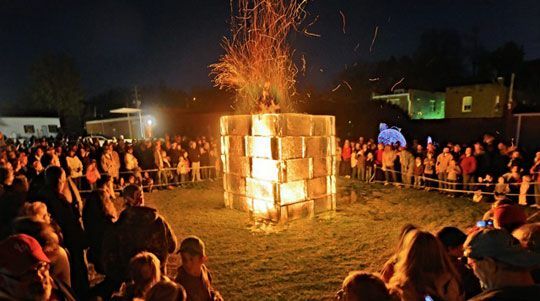 This unique extravaganza is hosted by The Riverfront Arts District and has grown and expanded in activities and attendance each year, adding the "Burning Man" to their already popular "House of Fire and Ice". "Burning Man?" "House of Fire and Ice?" Watch video from last's two amazing displays you won't find anywhere else other than at Fire Fest 2013. 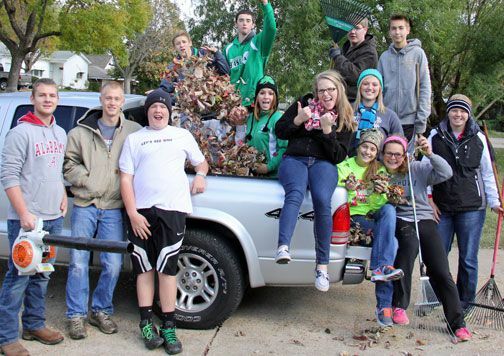 The "Leaf Raking A Team" and their truck filled with leaves. New Haven, Mo. - This afternoon 70 members of New Haven High School's Future Business Leaders of America (FBLA) were doing their part in giving back to the community. For 13 years now FBLA members have been raking leaves for elderly homeowners in a community project they call "Drive by Raking." New Haven, Mo. - Gifts in a jar, from your kitchen, make sweet (or savory) treats for friends and family. These mixes can also be budget-wise shortcuts for everyday meal preparation. Learn how with Mary Anne Burns. 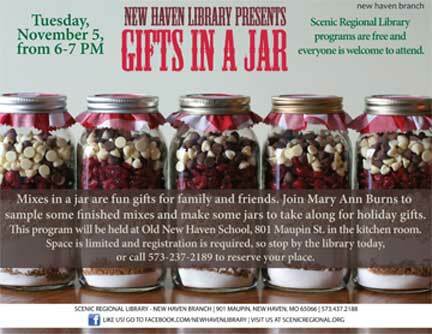 We will sample some finished mixes and make up some jars to take home for holiday gifts.